The news that you have a serious illness can be devastating. Your emotions can range from anxiety to fear to sadness. Your mind may be racing with questions about what the next days, months and years will be like living with this illness, and the impact it will have on your life and the lives of your loved ones. Initially, you and your family may not be able to think about what questions you want to ask your doctor, and need time to reflect. It’s important that you and your family learn as much as you can about the disease, its symptoms, how it may progress and what treatment options are available. Ask your doctor or healthcare team for more resources and information about your illness. Being educated helps everyone make shared, informed decisions and choose the type of care that can provide the most benefits based on your personal goals and wishes. You do not have to face a serious illness alone. From the moment of your diagnosis, JourneyCare will be there with you, every step of the way. By understanding and honoring you and your family’s unique needs, values and goals, we can help make each day the best it can be, however you define it. We start with the person, not the disease—because that’s what’s important to you. We’ll talk with you and your family about your specific situation, and what’s important to you right now…your goals, your values and your wishes. 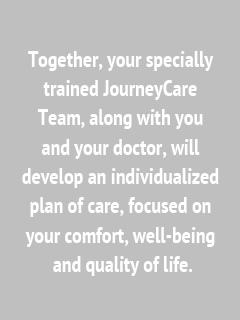 Together, your specially trained JourneyCare Team, along with you and your doctor, will develop a customized plan of care, focused on your comfort, well-being and quality of life. The JourneyCare team helps manage pain and symptoms that can make everyday life difficult, both during curative treatment and after treatments have stopped, and provide emotional and spiritual support as well as access to community resources to support your individual needs…just call us any time day or night.